A news flash broke out yesterday. 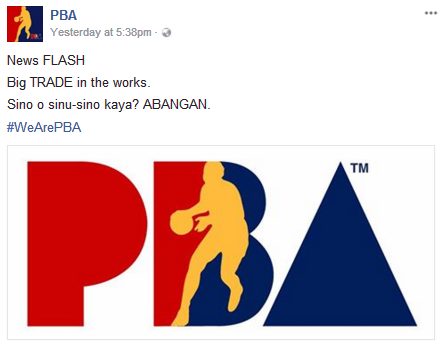 The PBA informed everyone that there will be a big trade that's in the works. Apparently, 4 players are again involved in the trade. As per reports, Star will be sending sharp-shooter Allein Maliksi along with the big man Chris Javier to Blackwater in exchange for former San Beda players BamBam Gamalinda and Kyle Pascual. The trade papers have already been sent to the office of the PBA waiting for the approval of Commissioner Chito Narvasa. 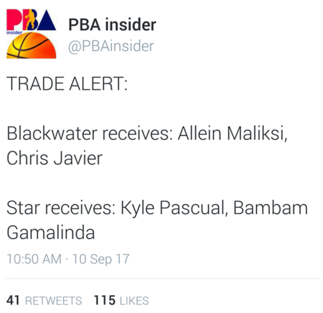 Labels: PBA Trade Update: 4 Players Involved Again! Take a look!